Melissa Mark-Viverito speaks at CannaGather in New York as host Josh Weinstein looks on. 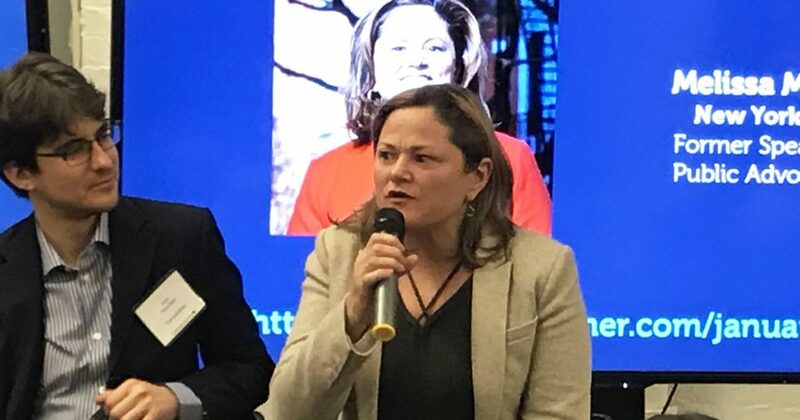 New York’s progressive former City Council President Melissa Mark-Viverito wants to be the city’s next Public Advocate. A special election will be held on Feb. 26. A total of 23 candidates are running. Five other current or former Council member are running. Public Advocate is essentially a watchdog position. However, it’s second in line to the Mayor, which makes this a particularly important race. Mark-Viverito made a campaign stop Jan. 22 at CannaGather, New York’s largest monthly meetup of marijuana enthusiasts. Running on the “Fix the MTA” line (a.k.a. Weed for Rails), she proposes to split tax revenues gained from marijuana sales between the equity and justice issues discussed above and New York’s transportation infrastructure. Over the last few years, the Metropolitan Transit Authority has been struggling to keep up with necessary subway system repairs. “Who here has been stuck in a delay?” Mark-Viverito asked. Many hands were raised. Her final salvo was directed at former Speaker of the House John Boehner, who joined the board of Acreage Holdings, a cannabis company, last year. The post Former New York City Council President Advocates for Marijuana Equity and Social Justice appeared first on Freedom Leaf.